We had lots of fun decorating our house for Easter this year. Here are a few fun and simple crafts! 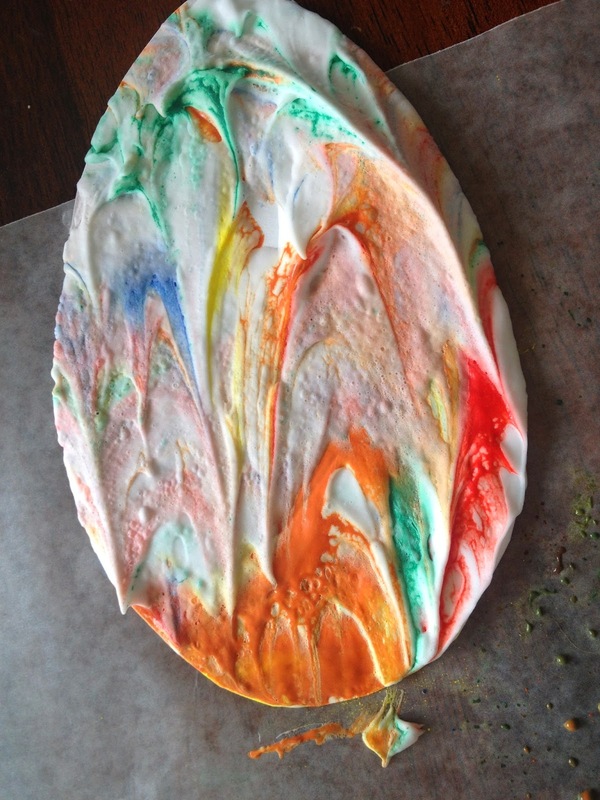 We squirted shaving cream onto a cookie sheet and then dripped different colored paint onto the shaving cream. Then my kids took turns swirling the paint with plastic forks (don’t overmix or you’ll end up with an ugly shade of brown!!). We gently laid our white cardstock eggs on top of the shaving cream and pressed down. Then we lifted them gently and laid them flat. After a few minutes we used the back of a knife to scrape of the excess shaving cream. We were left with beautiful marbled eggs! I gave each child 3 egg templates. We folded each in half lengthwise and glued the sides together to make a 3-D egg. Then they folded colored paper like an accordion. 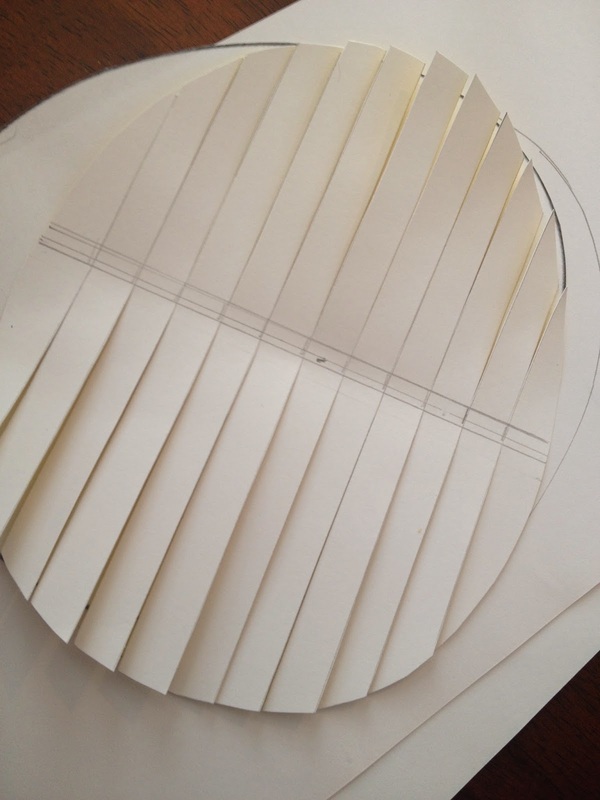 They glued the ends of each strip on their egg, gluing strips to all three sides. Then we threaded them through with yarn and hung them from the upstairs loft. I broke the spaghetti noodles in half and placed them in the large ziploc. Then I added green food coloring and several teaspoons of rubbing alcohol. We turned the back over multiple times to coat all the noodles with color. Then we laid them out on paper towels to dry. We glued our eggs on the blue background. Once the noodles were dry we lined the bottom half of our paper with glue and laid on our grass. I cut the bubble wrap into small squares for each child. Then they painted their square with different colors. They stamped their eggs in different color patterns. 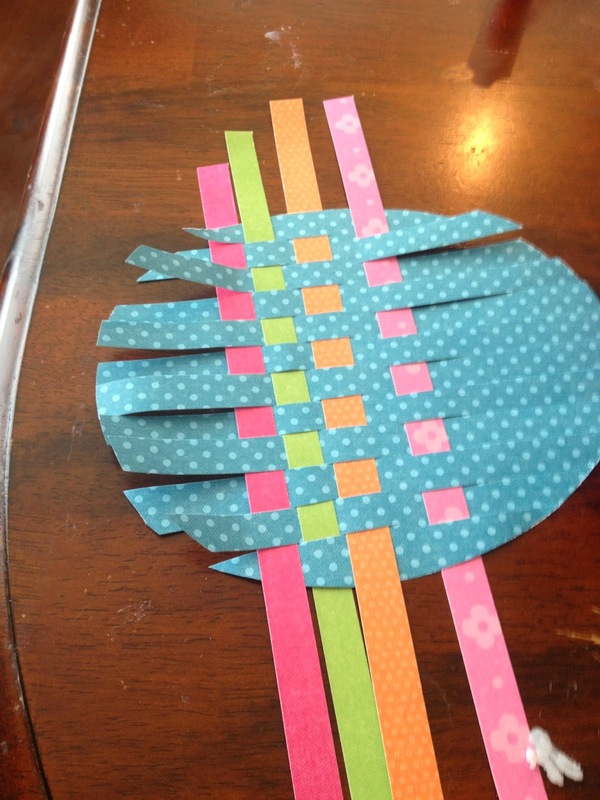 I cut scrapbook paper into one inch strips using my paper cutter. 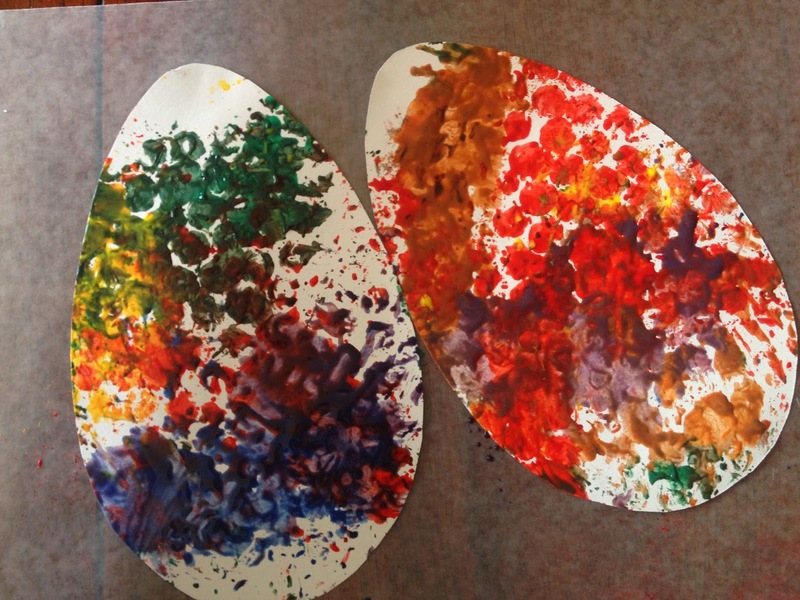 Then the kids chose their colors and made a collage on their cardstock egg (the paper will hang over the edge of their egg). Once they were dry I cut off the extra paper so the eggs would have smooth edges. I cut out my egg shapes and then made a horizontal line across the middle of the back. I then made marks at every half inch on that line. Using the ruler I made vertical lines at every half inch mark. I then cut from the bottom of the egg to just before the middle dividing line, following my guidelines. Then I turned the egg upside-down and cut from the top toward the middle line, stopping just short of that line. Then I had my fringed egg. 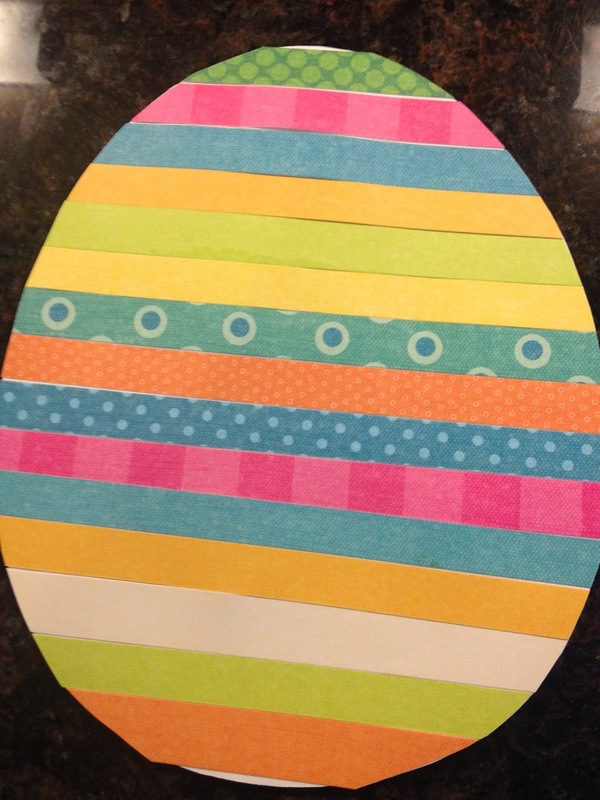 The kids wove their paper strips through the egg and I taped the edges. Once they were done I cut off any excess paper strips and reinforced the taped strips across the back of the eggs. 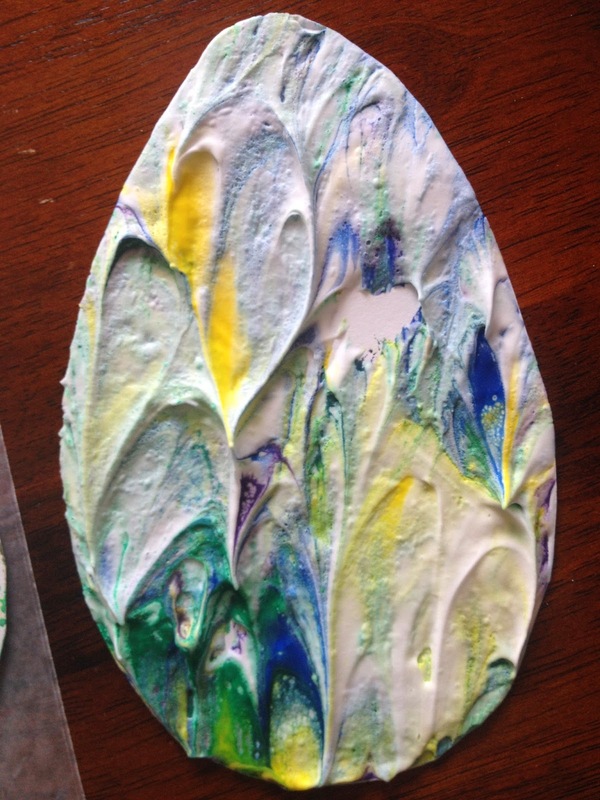 I cut out pastel paint chips in the shape of a small egg. 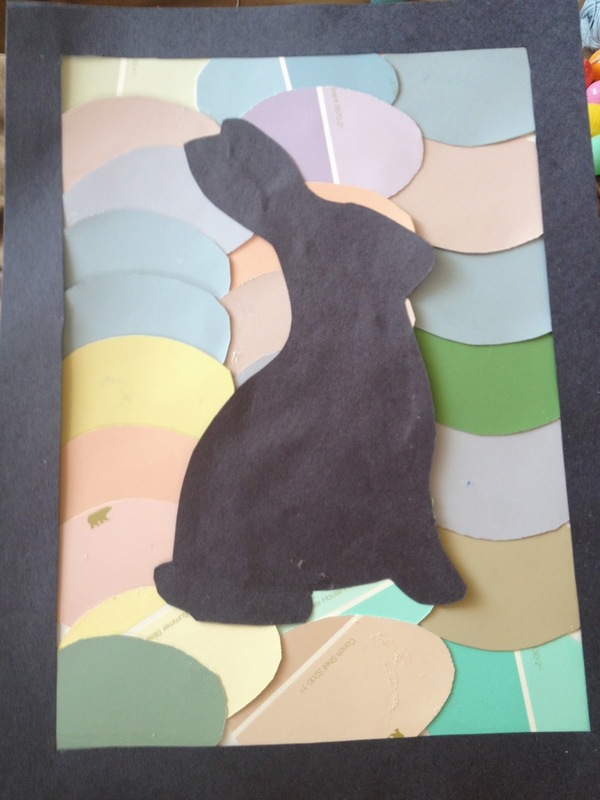 The kids made a collage with their paint chip eggs on a cardstock background. 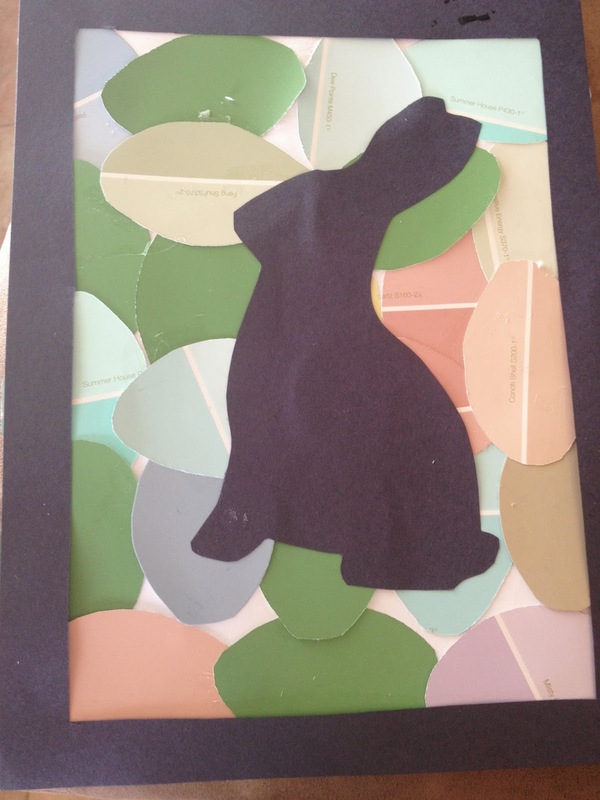 Then we glued a black bunny in the middle and made a border around the picture using strips of black construction paper. What a great collection of ideas! I especially love the spaghetti grass! Thanks for sharing on the Virtual Fridge! Oooo I love these ideas. Thank you so much for sharing. Wow 🙂 Definately pinning and sharing this so much goodness in one post! I will be featuring this post in this weeks Virtual Fridge hop. Wow, these are all so pretty! What lovely decorations. I especially love the marbled eggs and the egg collage art. I have never thought of using spaghetti to make grass before, what a wonderful idea. Thank you for stopping by and sharing on the Hopping Along to Easter blog hop and for sharing the button. I think the children and I are going to have a blast making some Easter decorations. You're welcome! We had such fun making these and they turned out so beautifully! I loved that even my toddler could participate and her art looked as amazing as everyone else's did. That was fun for her! Hope you enjoy making them! What fantastic decorations. 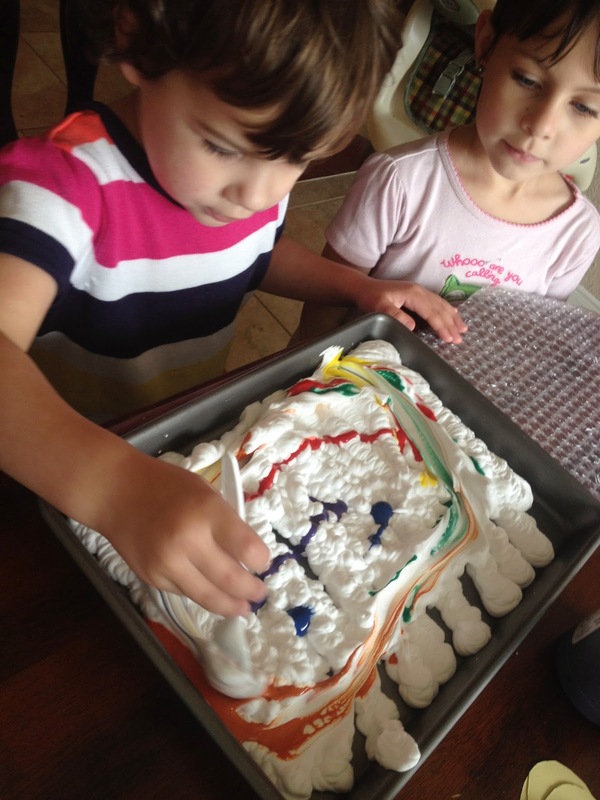 I love the shaving cream egg creation. Thank you! I will stop by when I have some fun posts to link up!